The amount of student loan debt now exceeds outstanding credit card debt in the United States. This is not surprising because acquiring a higher education is perceived to be necessary to landing a job in a competitive environment. Further, it is easier to borrow for a student loan than it is to borrow for other purposes, since unlike other types of loans, neither a job nor a co-signer may be needed. Moreover, the government often guarantees repayment of student loans, and it is not easy to obtain a hardship discharge of student loans in bankruptcy. Even so, it is not strictly true that you can never do anything about student loans in bankruptcy. For example, you can certainly pay, or partially pay, a student loan in Chapter 13 under the protection of the Bankruptcy Court. However, any unpaid portion will not be discharged in the Chapter 13. Otherwise, the Bankruptcy Code provides for the possibility of wiping these debts out without payment only by obtaining a “hardship discharge”. A hardship discharge is available only under extremely limited circumstances. Thus, you should not expect to file for a hardship discharge casually. A responsible lawyer would only recommend that route in circumstances where you have a reasonable chance for success. Furthermore, you should expect it to be expensive litigation, and for it to involve substantial time and effort on your part to comply with discovery demands and other trial preparation. In order to obtain a hardship discharge, the Debtor has the burden of proving three things under the governing Brunner standards. First, you have to prove that you cannot maintain a minimal standard of living for yourself and your dependents if you are forced to repay these loans. Second, you also have to prove that this state of affairs is likely to continue for a significant portion of the repayment period. Third, you also have to prove that you have made a good faith effort to repay the loan. This is a very high burden, and even homeless veterans have a hard time winning on this type of action. The easier and more cost effective way to deal with the problem is usually to call the student loan lender to explore forbearance or other available programs. If your loan is a federal loan, you may be able to explore options such as income based repayment. That option holds out the possibility of loan forgiveness if you make all required payments for many years, and if you comply with ongoing income verification requirements. State and private lenders would need to be contacted directly for any similar options that they might have. 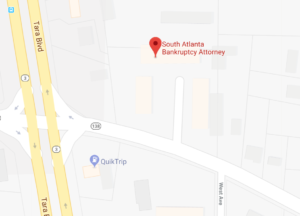 Bankruptcy attorneys Brooks Cotten and Gina Karrh have over 30 years combined experience in helping people with their financial problems. Call us today at 678-519-4143 to discuss your particular situation.